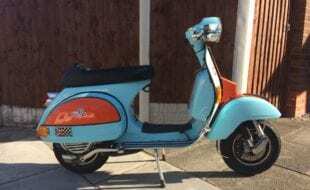 Women’s textiles and tuned Vespas may not be an obvious combination but in the world of corporate sponsorship anything goes. 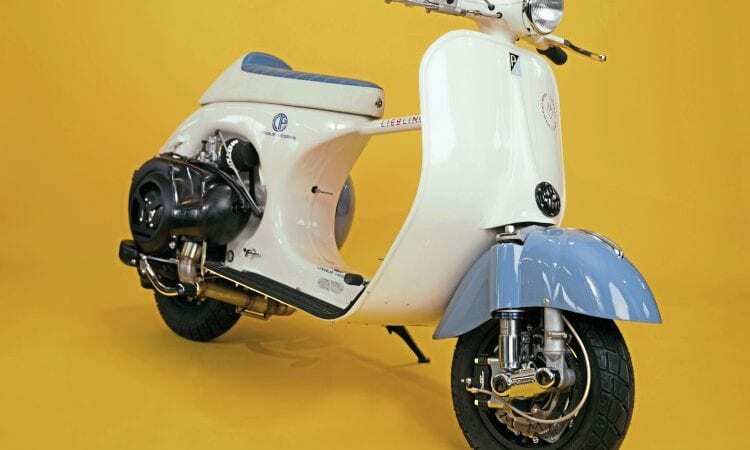 I’ll go out on a limb here and say that when German fashion house Lieblingsstück commissioned this Vespa it was a bold move. We’ve all grown accustomed to the use, or more often misuse, of Italian scooters in advertising campaigns. Most often these are photoshoots using a machine rented for the day, less common is the commission of a bespoke machine but the decision to have a corporate sprint racer built must be unique. Streamline seat mechanism is an object of beauty. 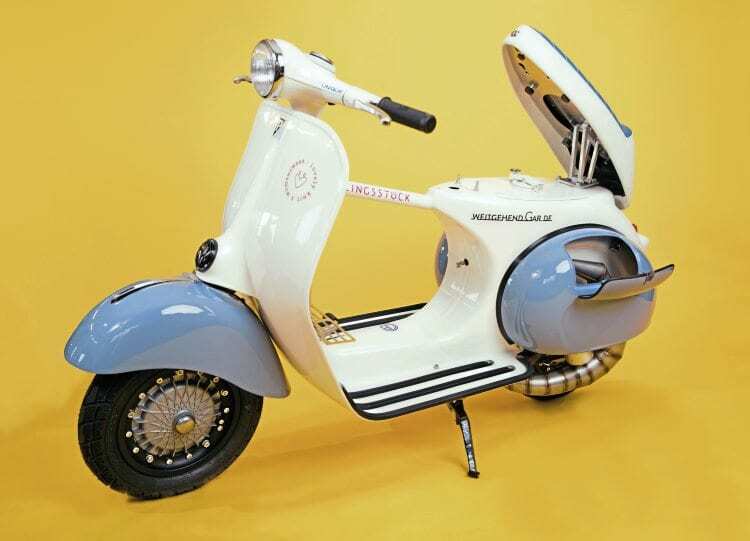 Established in 2013, Chiemgauvespa Tec Production (CTP) is the brainchild of Patrick Adam and his business partner Harald Greiner. 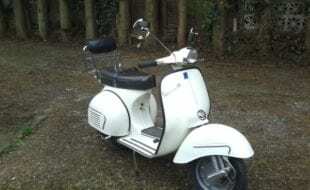 Patrick is a lifelong Vespa enthusiast and has maintained, restored, collected and raced Vespas for over 25 years. Based in Chiemgau, between Munich and Salzburg, the company has a diverse portfolio that includes product development, testing, racing and restoration. Although little known in the UK, the company has a strong partnership with Pinasco, acting as the contact point for all technical queries relating to the brand in Germany, Austria and Switzerland. 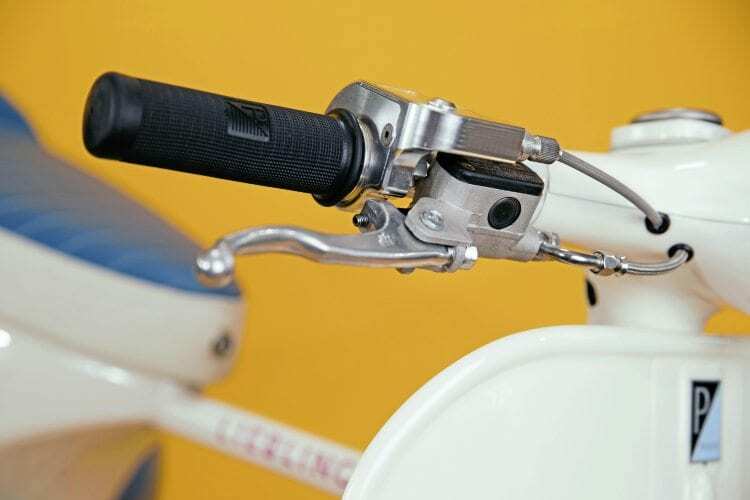 Quick action throttle, hydraulic brake, SIP speedo and specially machined split headset. 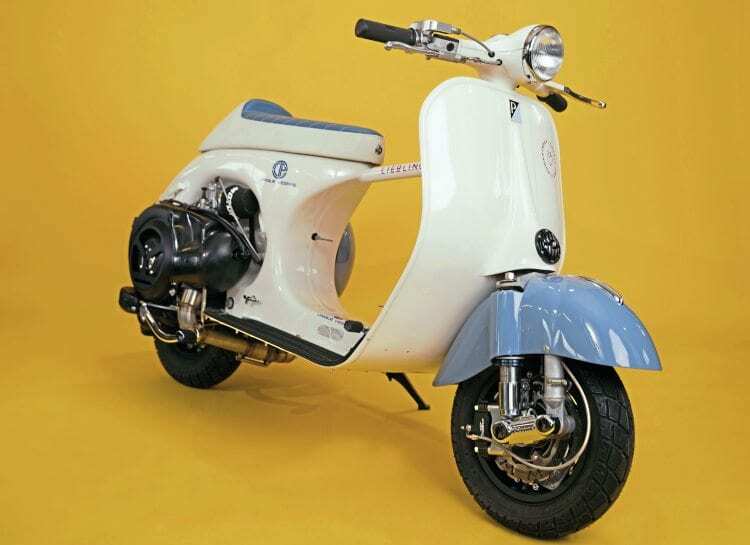 A separate brand within the company is Unique Vespas, using CTP’s engineering capabilities to produce one-off machines and components. 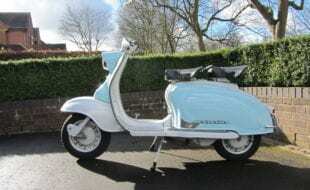 The promise is that no two Vespas will be alike — their approach being the very opposite of mass production component manufacture. A longtime client of CTP and also based in Chiemgau, is German fashion house Lieblingsstück. 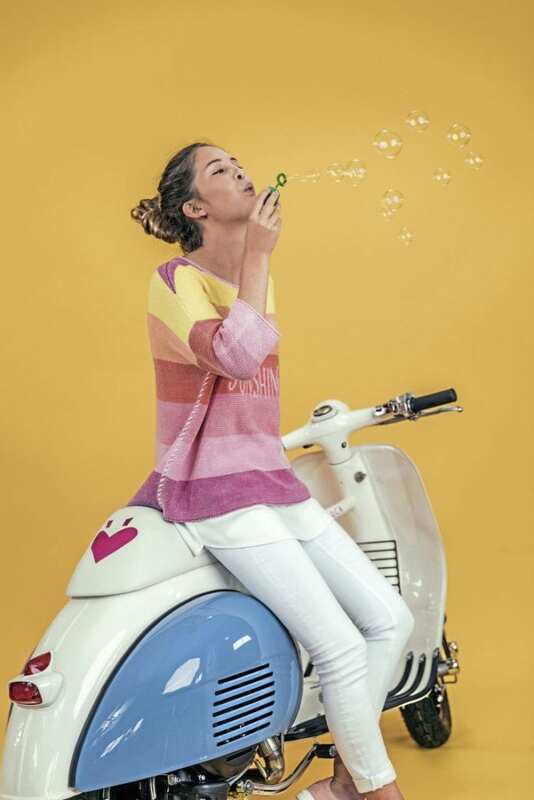 In common with many other retailers, Lieblingsstück has previously used Vespas to promote its brand. More recently the company made a decision to sponsor CTP’s race team, and the eventual result is this stunning blend of the CTP, Unique Vespa and Lieblingsstück brands. Finished in Lieblingsstück’s signature pastel colours, it’s easy to assume that this is purely a promotional tool but nothing could be further from the truth. Tuned for street racing and hill climbs, the old VNA kicks out 30bhp and has a true (GPS) top speed of 126.5kph (78.6mph). 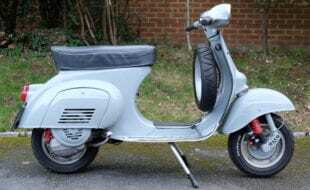 Given CTP’s relationship with Pinasco it’s unsurprising that their products have been extensively used but the overall package reads like a who’s who of modern scooter tuning. Rear frame has been modified to accommodate a curly exhaust giving extra ground clearance. The engine is one in a special ‘black’ edition of 30 complete engines produced exclusively by CTP, endorsed by Pinasco and featured on Pinasco’s stand at EICMA in Milan last year. Mounted to the black powder coated cases is a Pinasco nine-port 225cc kit, indeed almost all the tuned components are by Pinasco. Notable exceptions are the expansion chamber which is an Edelstahl New Line S+ Supersilent Curly and carburettor which is a 28mm Polini. With 30bhp to deliver, the crank has been substituted with a 60mm competition item and Pinasco’s CNC-machined Bull Clutch passes power to the gearbox which features Pinasco’s Grand Sport shortened third and fourth gear clusters. Ignition is take care of by Pinasco’s Flytech system utilising a 1.6kg flywheel. Tight ‘n’ Beefy at the front end with uprated shock, disc and rims. Adding ‘stop’ to the ‘go’ of any tuned machine is often problematic. CTP’s solution was to mate a Cosa steering column to Pinasco’s four-piston radial brake. Suspension has been tightened by using a Malossi RS24 on the front and SIP Performance 2 on the rear. 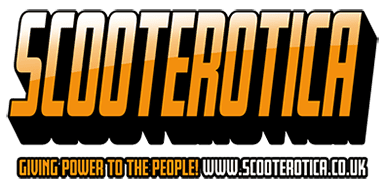 Not the average Scootering photoshoot. 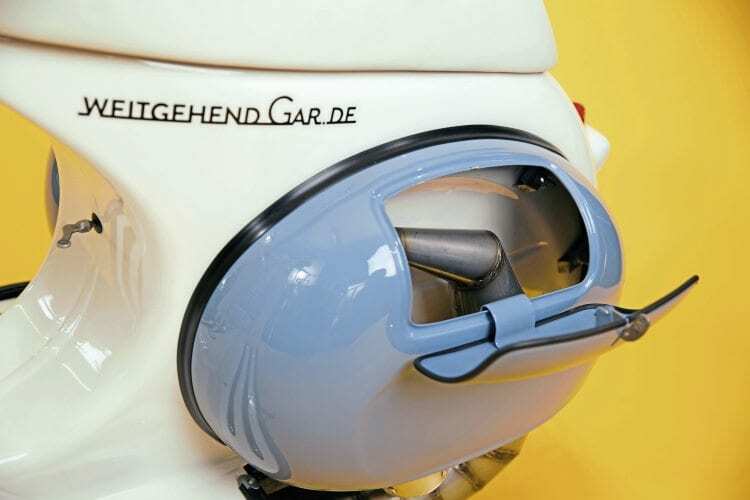 Cosmetically the bodywork features a seat frame and opening mechcanism by Streamline although Weitgehend Gar in Hamburg were contracted to provide the unique Lieblingsstück themed cover. Only noticeable when pointed out is the headset, now split like that of a PX providing easy access to cable, electrics and hydraulics. Finally, a SIP speedo is there to keep an eye on speed and critical systems. 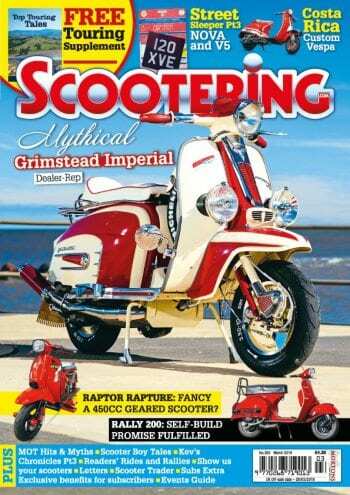 Just when it seems there are no surprises left, a scooter comes along that stops us in our tracks. For decades street racers have been adorned in bold race graphics, carbon or more recently satin black finishes. 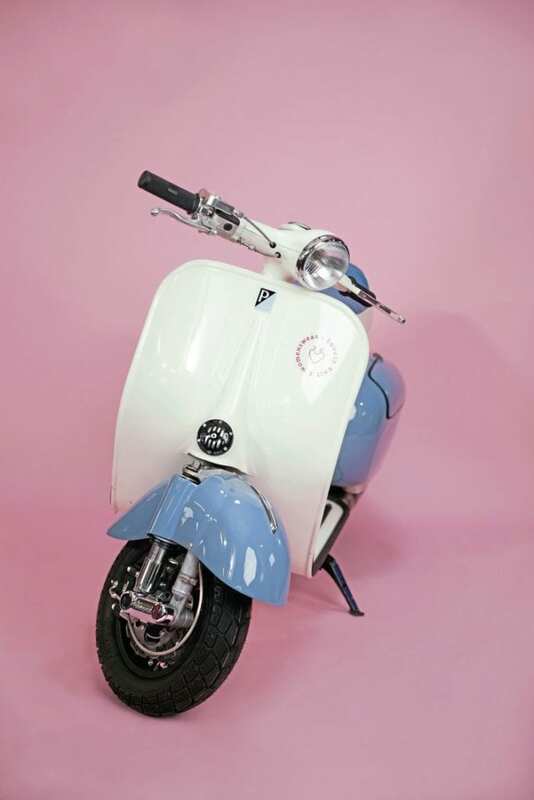 Project Lieblingsstück uses pastel tones that flatter the undeniably feminine curves of the earlier Vespas. Combined with state of the art technology it’s a scooter that refuses to be pigeon-holed. Racer, fashion statement or subtle custom? You decide. 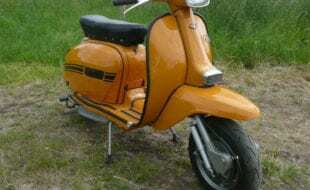 One thing I’m certain of is, pastel colours or not, I want to own it. 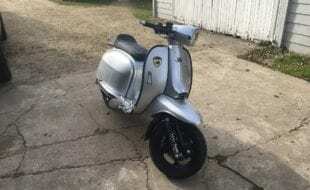 Model: 1958 Vespa VNA 1T. The enigne package is available from CTP ready to ‘plug and play’ for €4999. Exhaust: Edelstahl New Line S+ Supersilent. 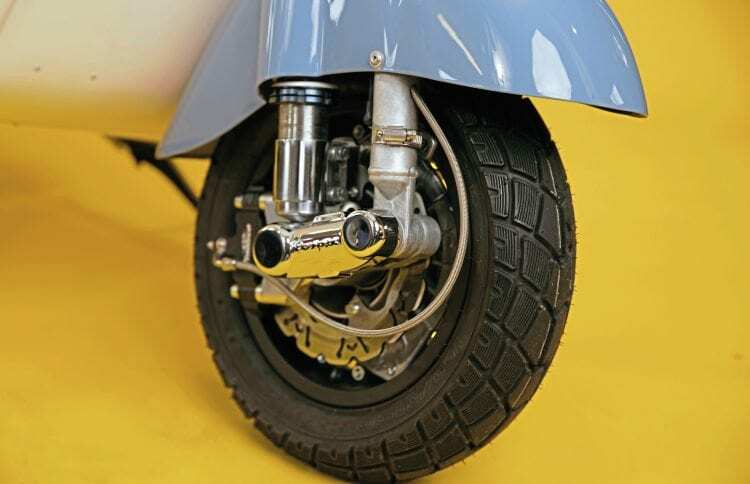 Suspension: Malossi RS24 (front) SIP Performance 2 (rear).